That’s why the work of charities like SwimTayka is so important. 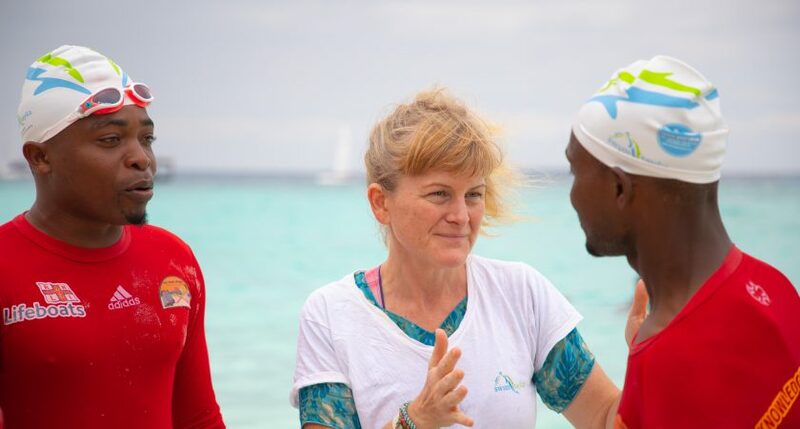 In September a team of three travelled to the Tanzanian island to assist a group of swim teachers there who are part of The Panje Project. This NGO focuses on training and education for young people, and one of it’s most important missions is to teach the local community how to swim. Panje has been offering an aquatic survival programme to children since late 2013, assisted with funding and training support from amongst others, the RNLI. Our mission as team SwimTayka was to assist the swim teachers already working with the project with learning new skills which they can in turn hand down to the children. Aquatic survival schemes usually involve a basic learning of frontcrawl. It was decided between Panje and SwimTayka that it would benefit the local swim community greatly if the children had the opportunity to learn other strokes – namely breaststroke, backstroke and sidestroke. We arrived with little idea however exactly what we were going to do with our two weeks there. Following discussions with the project leaders and the 12 teachers we began to make up a plan. 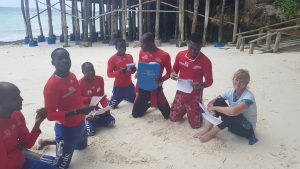 Each day we would spend around 3 hours with our ‘students’ and several more hours writing up a swim training programme to hand to the project, detailing all the work we were teaching over the fortnight. One of our biggest issues was the majority of the teachers only spoke Swahili, but thankfully one of the team, Ali had a good command of English and he did a sterling job translating for us. Though luckily too when swim teaching it is amazing how much knowledge you can pass on to others merely by demonstrating with body actions. It wasn’t easy for the teachers. None of them had swum the new strokes we were teaching. Some also had to travel fair distances as well to get to our teaching area, which was in Nungwi on the far northern tip of the island. We had a classroom to hold the theory sessions in, and then our swimming pool was basically the sea. The water was amazing – incredible blue hues, really rather salty and a perfect temperature of around 25 or so degrees. Nungwi is very much a tourist area nowadays, so for beachgoers catching a few sunrays it must have been an interesting spectacle seeing our posse of swim teachers rocking up every day for our sessions. We had a ‘lane rope’ that was set up in the water marking out our teaching area, weighted down with water containers filled with sand. For me, it was a steep learning curve. I’m used to teaching children to swim normally on a one to one basis in the UK. While the work I do in drowning prevention in Bangladesh involves being with the children and getting them confident in the water. Here we were actually training other teachers. But it was fun and rewarding as time passed, to see our students understanding the basics of the new strokes. By the end of the two weeks 11 of the group passed the exam we wrote up for them, while the remaining teacher did well enough to still be a swim teaching assistant. Part of our work with the group as well was to help them in setting up swim clubs in 4 or 5 areas on the north of the island. 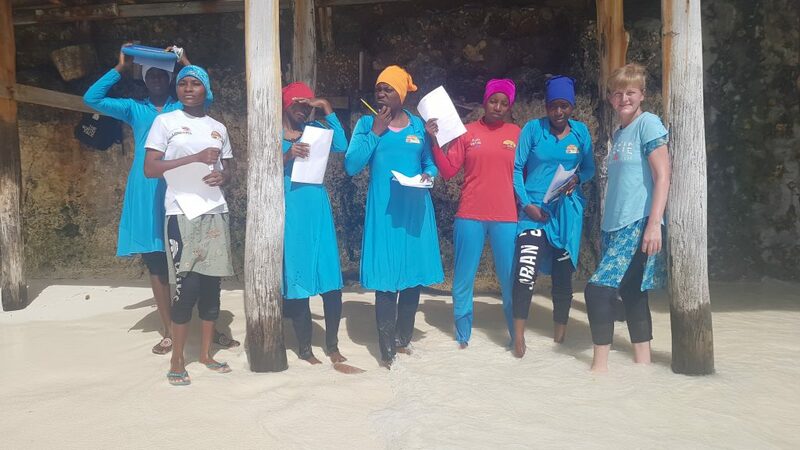 Thanks to our visit to Zanzibar they will now be able to run swim programmes in their new strokes, hold competitions between the clubs and ultimately help the local children have fun and learn more about swimming. At the end of the trip it was so rewarding to know that hopefully generations to come will be inspired by our work, and that others who have none of the opportunities we have back home have learnt something new which will be such a benefit to their local community.